Curriculum Associates has expanded its family of Ready programs with the launch of Ready Writing for grades 2 through 5. Built to support the Common Core State Standards (CCSS), Ready Writing provides educators with instructional materials as well as professional development resources. The program is designed to work with any ELA curriculum, including Curriculum Associates’ Ready Reading. Ready Writing uses a gradual-release instructional model that breaks down the complex CCSS into discrete segments that build over the course of a lesson. Each lesson starts with the study of a mentor text that models the structure and organization of exemplary writing. Throughout the lesson, students are encouraged to analyze the mentor text, learn how to use it as a model for their own writing and get guidance from a writing buddy. Ready Writing assignments ask students to integrate information from source texts, many of which are shared with Ready Reading. 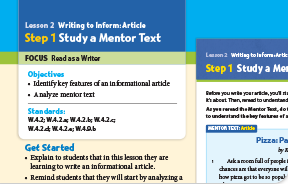 In addition to the instructional materials, Ready Writing also includes a Teacher Resource Book that offers professional development and step-by-step guidance to help teachers address the CCSS writing standards. The program also includes access to an Online Teacher Toolbox.